In September of 2015, Rich & I revisited one of our most favourite countries, the USA. We love the wild landscapes, the big skies, the endless horizons and the ever changing diversity found while traveling from state to state. There is always so much natural beauty to see and so many adventures to be had. Like many people I love the ocean. The mysterious beauty of it is indescribable. While gazing out to sea, witnessing the rhythmic pull of the waves, the power of the ocean and the sense of hope it gives is almost hypnotic. 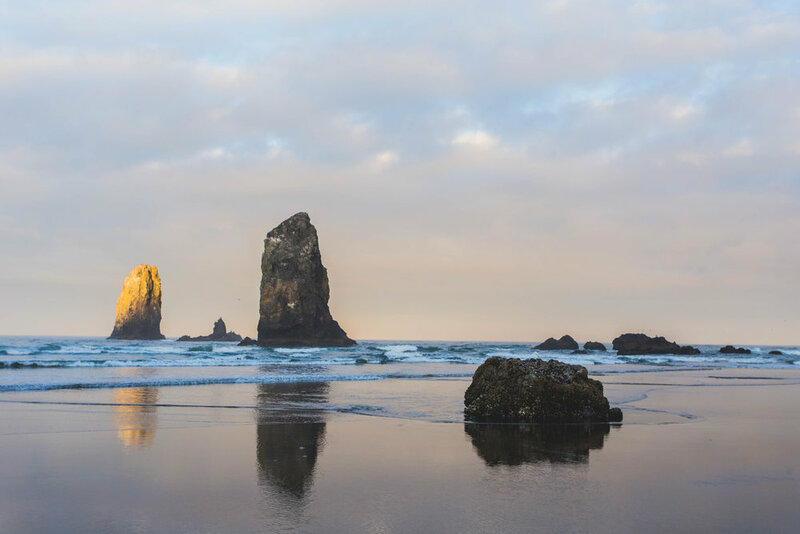 Cannon Beach is located on the Pacific Northwest Coast of Oregon, 80 miles west of Portland. 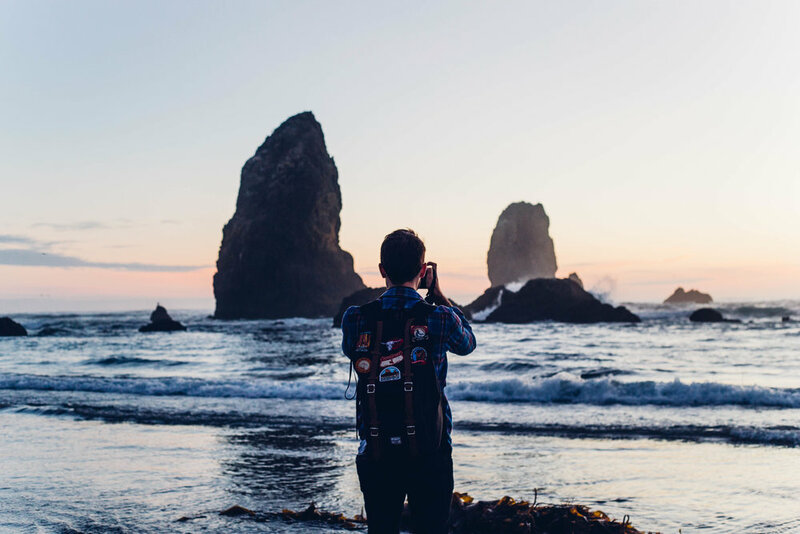 It is one of Oregon’s quaintest and most picturesque locations, made famous by the beautiful Haystack Rock and Needles that mark its shoreline. At first sight Rich & I knew that this place had an ethereal beauty about it and that we very much wanted to capture some of its magic. 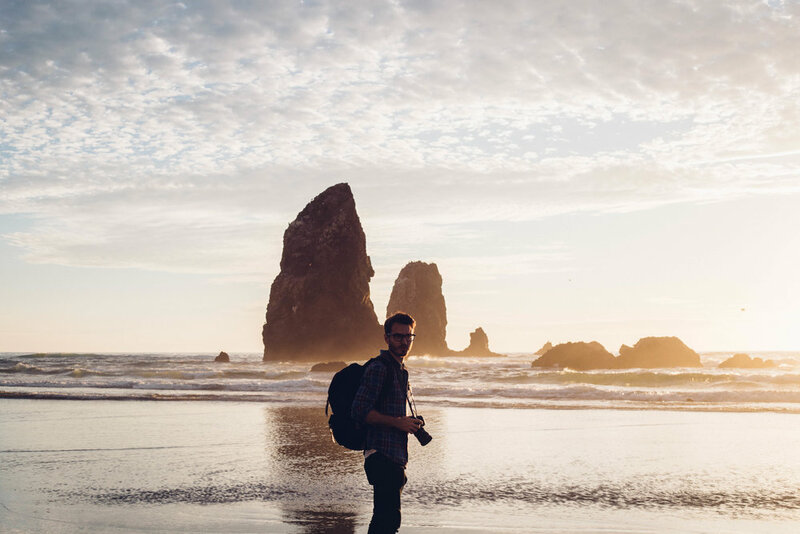 The photographs that follow were my own way of documenting our brief pocket of time at Cannon Beach, where we experienced first hand how environments, colours, shadows and even feelings can be transformed at the moment of the rising and setting of the sun. 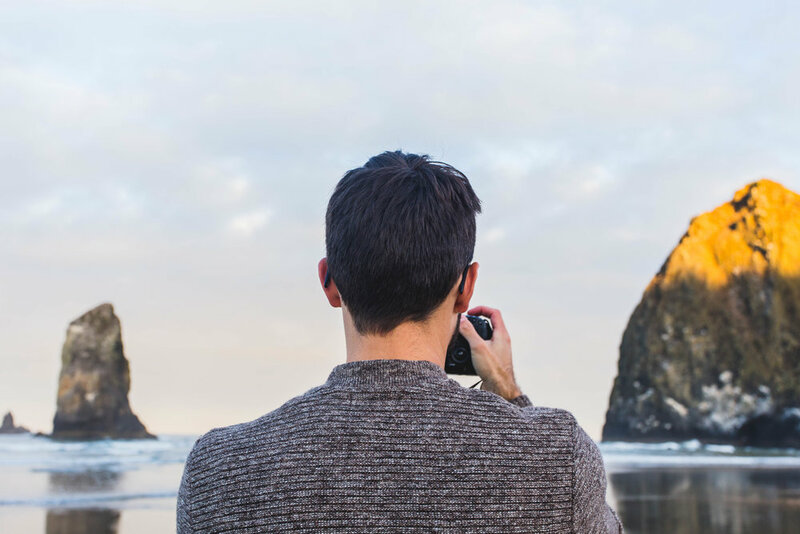 Adjacent to the large rock formation known as Haystack Rock, are its brothers known as The Needles. These three independent sea stacks act as watchmen, guarding their coastline and nurturing the native wildlife. Although we didn’t see any that day, Puffins are often spotted nesting on these rocks. The birds we did see… Although Seagulls are common all over the world’s coastlines, these little guys are still lovely friends to have while walking on the sand. Provided they understand you don’t have any food! It was incredible to observe just how little time a sunrise lasts. The light changes with every blink of the eye and before you know it, the blossom pink hues of dawn are gone, the sun’s intense yellow rays are hitting the rocks and all is over. The ethereal beauty of ‘Golden Hour’. This light is fleeting. “Time is like the ocean, you can only hold a little in your hands.” Once the sun has started its descent, oh so quickly twilight arrives. Gone are the soft golden hues and long shadows of that particular moment in time, and instead an intensity of over-saturated colour floods the skies. It’s strange, it seemed that everything became the most alive with the dying of the light. One last surge of beauty and energy before inky darkness took hold.